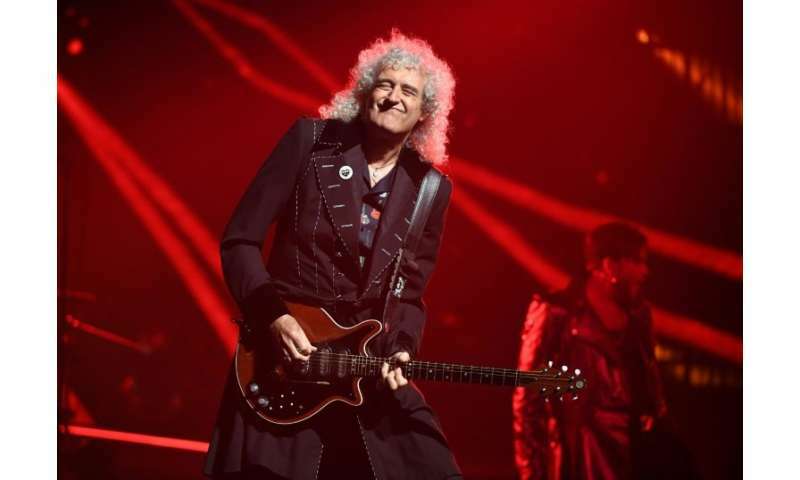 Jamming and astrophysics go hand-in-hand for Queen lead guitarist Brian May, who announced Wednesday he is releasing a musical tribute to a far-flung NASA spacecraft that is about to make history. The US space agency's New Horizon's spacecraft will soon make the most distant flyby of a cosmic object ever, zipping by an object called Ultima Thule—a billion miles (1.6 billion kilometers) beyond Pluto, on January 1. A NASA scientist involved with the mission asked the legendary British guitarist behind "Bohemian Rhapsody"—who also holds a doctorate in astrophysics—to contribute some music to play as the flyby occurs. And May, 71, agreed. The "New Horizons" track (Ultima Thule mix), which will be released New Year's Day, is his first solo single since 1998. "For me it's been an exciting challenge to bring two sides of my life together—astronomy and music," said May in a statement. "I was inspired by the idea that this is the furthest that the Hand of Man has ever reached -– it will be by far the most distant object we have ever seen at close quarters, through the images which the spacecraft will beam back to Earth," he added. "To me it epitomizes the human spirit's unceasing desire to understand the Universe we inhabit." Portions of the wailing guitar track, overlaid with the voice of the late legendary scientist Stephen Hawking, are already available on www.brianmay.com. A third installment in expected in the next few days. Scientists do not yet have a clear picture of exactly what Ultima Thule is, whether a single object or a cluster, spanning about 19 miles (30 kilometers) in diameter. But when New Horizons passes, it should capture images at a resolution of 98 to 230 feet (30 to 70 meters) per pixel. New Horizons completed a successful flyby of Pluto three years ago, and returned stunning images of the dwarf planet. I would never, NEVER have imagined that lead guitarist, Brian May of Queen was/is an Astrophysicist. I/we are very impressed. Who would have believed that such a talented guitar man could also be a Nerd - and I say that with the utmost respect. Title - "Queen guitarist Brian May releases tribute to NASA spacecraft"
Why does the article title contradict the article content? Has the author been drinking? Is the author just American stupid?